Everything is now ready for this years gang of 5 young Little Owls to be released. 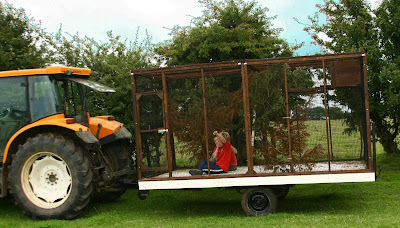 As you will see from the pictures below this year we have a newly constructed portable aviary. 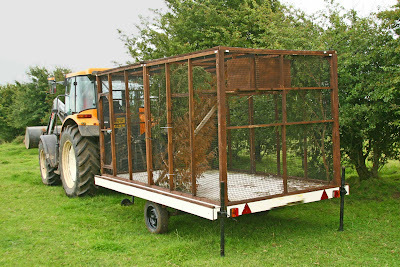 Which as it's name suggest can be transported anywhere, meaning of course, that once a good release site is found we just wheel in the portable aviary put the birds in, let them acclimatise to their new surroundings then off they go. Everything is, from pre to post release, monitored. That means, habitat, searches for predator competition, and full post release monitoring. However farmers are a great people to work with, and always want to help Owls. 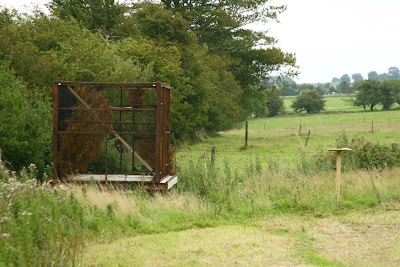 So as you can see above the farmer where the Little Owls are to be released, obliges by towing the aviary to the pre-selected Owl release location. Now I had warned the kids, that if they were noisy and troublesome they would end up trapped in the aviary only to be fit for Little Owl food, and I always keep my promises. See below!!!!! They settled remarkably quickly, into the release aviary, with their commanding views across what will become in the months to come new wild hunting territories for them. This all happened 2 weeks ago, and now of course the week commencing 24th August sees the big count down for the door of the aviary to be opened and release into the wild. This year I'm hoping to bring a full video diary of the release with the usual back up of photographs etc. Of course if you are a Hawk and Owl Trust member and have helped with monitoring a release before then you are about to get an e mail. If you want to join the Hawk and Owl Trust and help out then let me know by e mail. 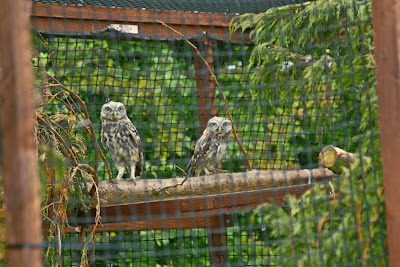 Special thanks must go to Paula (HOT volunteer) ((Sorry Paula HOT stands for Hawk and Owl Trust, nothing else, honest)) and her family for all the help so far with this release, and a big thanks to Animal Affairs for their help with funding and Jemima-Parry Jones for allowing the Little Owls bar one to come west.. 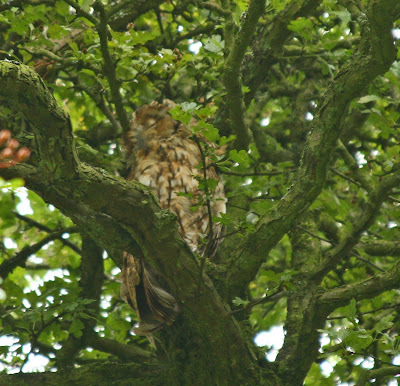 Meanwhile some of you have been asking about how the Tawny's did, well here's the latest picture of one of the young Tawny's released 4 weeks ago, as you can see he/she is having the day off from distribution and enjoying a sleep. BFN and hopefully the first of the videos will come out by next weekend. Its me crossing fingers not any of you..and please who ever you re god is, pray to them for good weather next week? All Eagle Owls should go to this link to see what they can really do. All they need to do is wear a big "S" on their fronts and pull on some underpants over their tails. What is really worrying is in the comment section were by it is discussed that a Eagle Owl cull is already happening. I have heard of this before, I just hope its not true! I should state here and now that this bird is obviously of captive origin, but even so to come out with myth like this does no favours for this Owl or indeed every other flying predator at all. I can only imagine how loud the laughter is coming out of the rest of Europe, at the way we in the UK think of predators. Its funny yet sad, as Alar Broberg from Sweden stated the other day.